Israel says it has inflicted huge damage on Syrian air defences after one of its fighter jets was brought down during a raid over Syria. The response was the "most significant attack" of its kind against Syria since the 1982 Lebanon war, said senior Israeli air force general Tomer Bar. 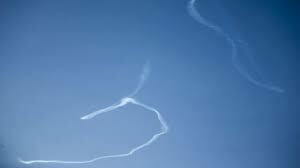 The F-16 jet went down during a mission that followed an Iranian drone launch into Israeli territory, Israel says. Israel says it responded with a second wave of strikes on both Syrian and Iranian military targets operating inside Syria. Israeli air strikes in Syria are not unusual, BBC Middle East correspondent Tom Bateman says, but the loss of an Israeli fighter jet marks a serious escalation.